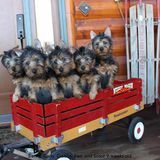 2014 has been a pivotal year for Dunham Lake Australian Terriers in so many ways, it’s hard to even know where to  begin. First and foremost, I want to thank God for his many blessings. We believe everything happens for a reason  and according to His plan and we try our best to follow.  I thank my family, my husband for his patience and grace to let me pursue my passion with two of our three amazing daughters who  without his support we couldn’t do what we do. 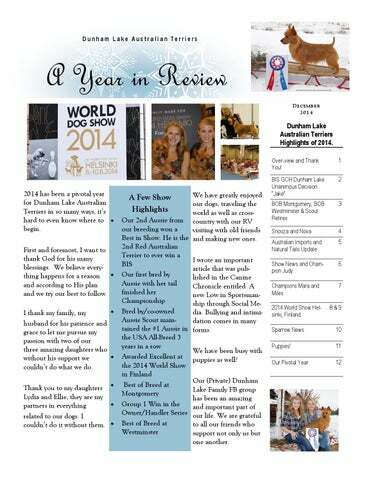 Dunham Lake Australian Terriers Highlights of 2014. We have greatly enjoyed our dogs, traveling the world as well as crossOur 2nd Aussie from country with our RV our breeding won a visiting with old friends Best in Show. He is the and making new ones. 2nd Red Australian Terrier to ever win a I wrote an important BIS article that was pubOur first bred by lished in the Canine Aussie with her tail Chronicle entitled: A finished her new Low in SportsmanChampionship ship through Social MeBred by/co-owned dia. Bullying and intimiAussie Scout maindation comes in many tained the #1 Aussie in forms. the USA All-Breed 3 years in a row We have been busy with Awarded Excellent at puppies as well! the 2014 World Show in Finland Our (Private) Dunham Best of Breed at Lake Family FB group Montgomery has been an amazing Group 1 Win in the and important part of Owner/Handler Series our life. We are grateful Best of Breed at to all our friends who Westminster support not only us but one another.